I graduated college in 2012 with my bachelors of science in mass communications. I knew I wanted to go bad to graduate school, but after I graduated, I found a job as an assistant store manager at a retail boutique, and within three months, I was the store manager. My schedule was full. I was working over 40 hours a week, with a one hour (each way) commute into a different time zone. It was a struggle. 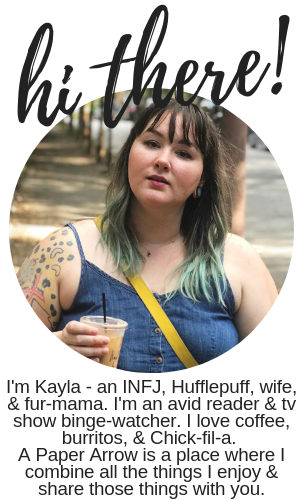 My goal was to work in a higher education setting, and after two years of applying, I started working at my alma mater in an enrollment management setting. I loved it, but I still wanted to get my masters. Soon after starting in my new role, I found out the university system I work for grants tuition assistance for its full-time benefited employees - basically, I could go back to get my masters at no cost out of my pocket. I was thrilled. So now here I am, a full year into my masters program, with a little over a year to go (due to some lack of flexibility and also working full-time, etc. etc.). As an adult and a full-time professional, my average day of school is a little less typical than that of a traditional undergraduate student, which means the items I tote around in my backpack are a bit different. 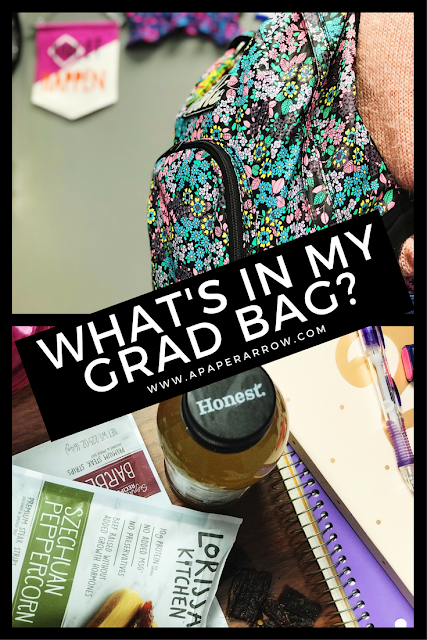 I wanted to share what's in my backpack to get my through those long days when I have class. Spiral bound notebook - I prefer it to a three-ring binder, because with binders, I always rip out my pages or mess up the rings. Spiral bounds keep it all together and have pockets. I usually store my notes and readings here, too. Books for class - Duh, enough said. Large annual planner - I put things in my phone, too, but nothing's like a good ole physical planner. I prefer it notebook size to add things by the hour and get really detailed. As a full-time professional and a graduate student, I really have to plan out all the details to make sure I set aside time for work, class, homework, and personal time (because it should also be scheduled in). Mechanical pencils - I love one that has an extendable eraser and is a bit thicker than a traditional pencil. If it's too thin, my hand may start to cramp up. Pens in a variety of colors -Multiple colors are perfect for color coding and keeping things organized, when taking notes and within a planner. Highlighters in different colors - Again, the different colors are important to keep organized, both in notes and in scheduling. A novel - I tote a book with me literally everywhere I go, including in my backpack. Sometimes I may have just a bit of time between work and class. While I'd always rather be reading a novel, breaks between class really provide a solid bit of time to get some pleasure reading in. Hair ties - When I get really serious, whether at work or in the classroom, I tend to tie my hair back. So I usually have a hair tie on my wrist, I tend to keep some in my backpack, too, just in case. A light jacket - You never know what the temperature's going to be in class. It's better to be safe than sorry. Hydration and a light snack - Grad classes tend to be two and half hours or so. Not to mention sometimes I go straight from work to class with less than a 30 minute break between. So toting a snack with me is imperative. Since I'm on a never-ending journey to wellness, I prefer to tote something with me that is better for me and really helps me to try and lead a lifestyle of wellness. 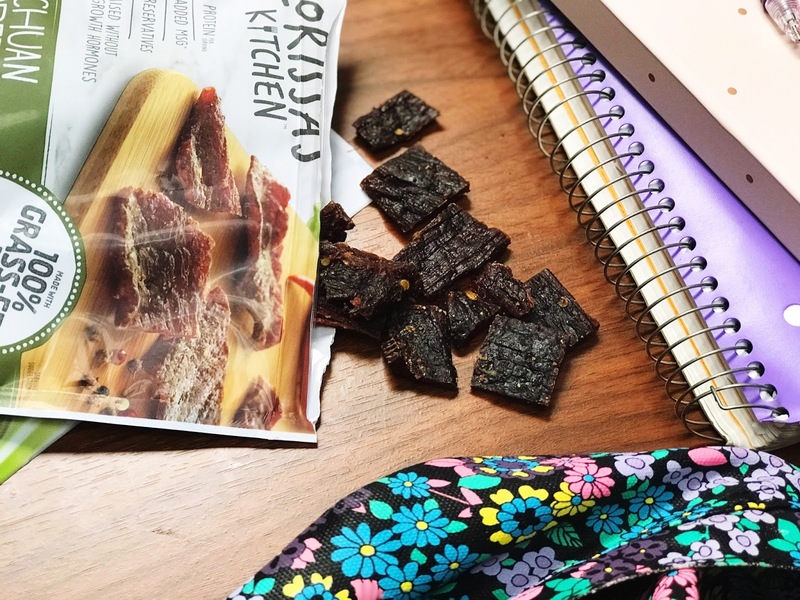 I'm not always on my best behavior when it comes to food, so I try to snack on something that has better-for-you benefits and is portable, but also really delicious. 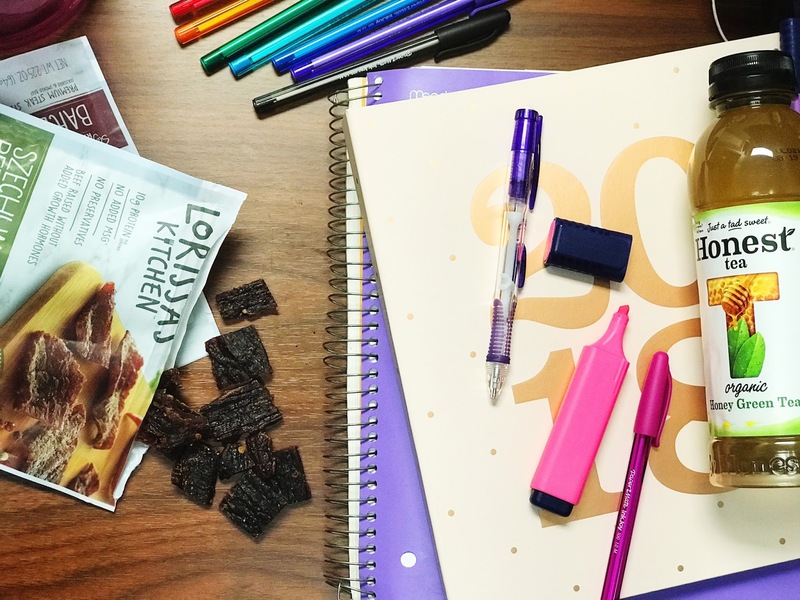 That's where Lorissa's Kitchen™ Premium Protein Snacks and Honest TeaⓇ come into play - and they go perfect together. 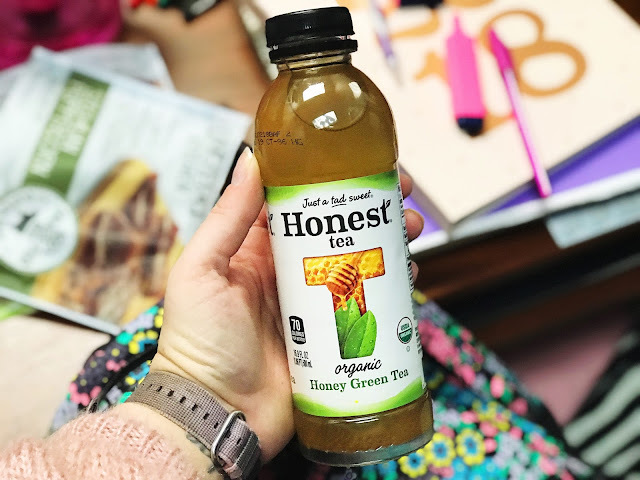 Honest Tea comes in a few different flavors - either unsweetened or just a tad sweet, so you're not sipping on sugar. And Lorissa's Kitchen offers four different flavors of Premium Protein Snacks: Korean Barbeque Beef, Sweet Chili Pork, Ginger Teriyaki Chicken, and Szechuan Peppercorn Beef. The best things about these snacks are how wholesome they are. Lorrisa's Kitchen provides 100% grass-fed beef and responsibly raised pork with no preservatives, added growth hormones, added MSG, or added nitrates. Not to mention they're gluten-free. For a limited time, you can earn $1.00 cash back through Ibotta on any variety 2.25 oz. 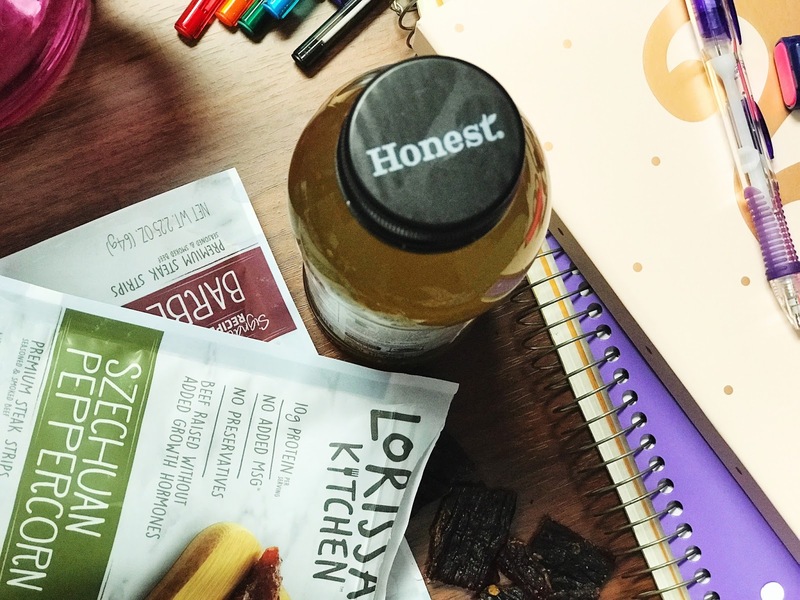 bag of Lorissa's Kitchen Premium Protein Snacks and any single bottle of Honest Tea when purchased together. 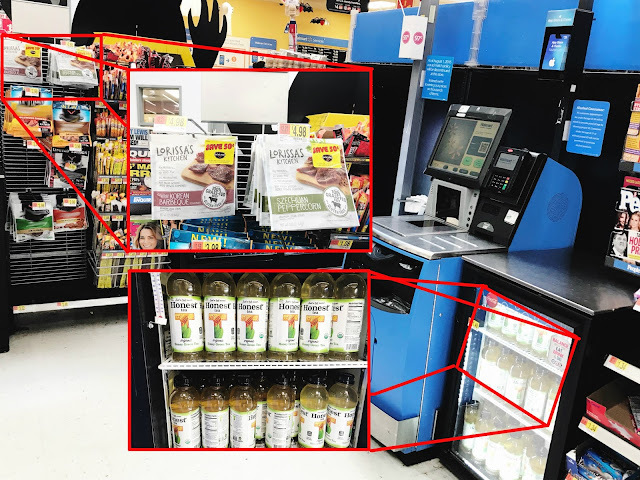 You can find both Honest Tea and Lorissa's Kitchen snacks near the checkout lanes at Walmart - I specifically found the in the self checkout at my local store. So, what are you waiting for? Head to your local Walmart and pick up some snacks. 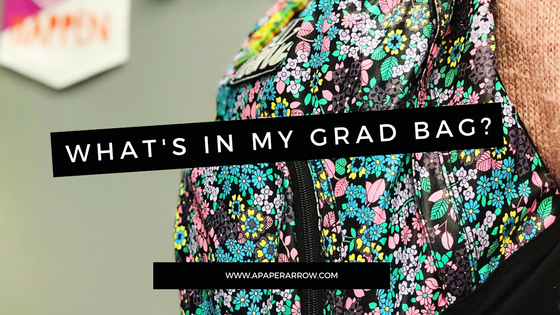 What else do you keep in your grad bag? It's one of the best perks of my job - I love it.